Hier ist der perfekte Ort für Ihren Familienurlaub oder einen Ausflug des Paares. Pearly Pond bietet alle Ihre Lieblings-Outdoor-Aktivitäten. Wählen Sie aus Schwimmen, Kanu (Kajak), Wandern, Mountainbiken oder Angeln. Wenn Sie mehr in entspannend sind, strecken nur mit Ihrem Lieblingsgetränk auf dem Deck oder auf Ihrem eigenen Strand rumhängen. Der Strand ist sandig und sicher für kleine Kinder. Wir bieten Ihnen ein schönes, sauberes Haus mit 75 Meter langen Sandstrand. Die Deck Treppe kommen bis auf den Rand des Wassers. Es gibt eine gut ausgestattete Küche für Ihre Bequemlichkeit und viele gute Restaurants in der Umgebung, wenn Sie es vorziehen, zu gehen. Der Market Basket-Shop ist nur 2. 5 Meilen entfernt und es gibt auch eine Hannaford / der Wal-Mart nur 1 Meile weiter in die gleiche Richtung. Sorry, aber dieses Haus ist nicht behindertengerecht wegen Treppen. Berg Monadnock bietet schöne Wanderwege mit einer spektakulären Aussicht und es gibt viele andere Walking, Wander- und Radwege in der Umgebung. Die szenische Monadnock Zweigschiene-Trail fährt knapp über 7 Meilen von Webster Street in Jaffrey in der Nähe der Ball-Feld der New Hampshire-Massachusetts Grenze. Von Jaffrey Rindge ist der Weg gepflastert und beinhaltet Beschilderung und eine herrliche Aussicht auf Teiche und Feuchtgebiete. Von Rindge in Richtung Massachusetts ist der Weg noch unentwickelt und ist vor allem Kies und Sand gepackt, mit einigen Eisenbahnschwellen noch an Ort und Stelle. Wir buchen jetzt für die 2015 Saison. Sommerpreise sind $ 1.100 pro Woche (Woche nur) .PRE-Zahlung einer Kaution im Voraus per Scheck für $ 300 erforderlich ist, Vorbehalte zu halten. We had a wonderful time staying at this cottage. It's small but cozy and comfortable for a family. The cottage is right on the water with a big deck and a beautiful view. The owners were great to work with and are very accommodating. The location is convenient to many attractions and the price was reasonable. The negatives are: Parking is very minimal. There is a very steep and uneven set of stairs down to the cottage that are borderline treacherous so I would not recommend this rental for the elderly or handicapped. Overall we were very pleased and would recommend the rental. We would stay again. I loved our weekend getaway in June and then again in Oct of 2011 with my husband and my little dog. He had the best time. I remembered to bring my doggie gate to keep him from going down the stairs. The one that you had on the deck he was able to get through. He is only 7 pounds. I'm so glad I was able to book the cottage again for Oct 2012. This time I'm really looking forward to the 1st girls scrapbooking weekend retreat. This might just have to become a multi year visit. Our stay at this affordable cottage was very pleasant and relaxing. The listing and photos described this cottage exactly. The owners ensured all our needs were met and made us feel at home. There are plenty of activities, attractions and restaurants within driving distance. 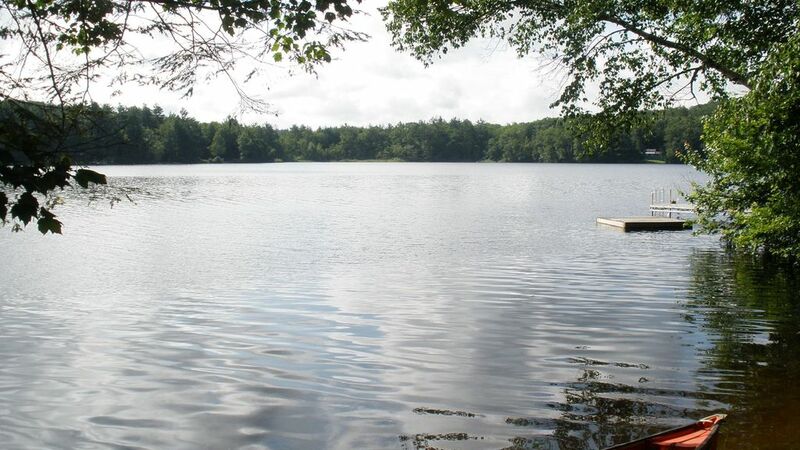 You can enjoy fishing, swimming and canoeing at the cottage. Mount Monadnock is not far away and is fun to climb. I would enjoy staying here again as well as recommending it to friends and relatives. We had a great time, very cute cottage with everything we needed. The only thing we were a little disappointed in was the murkiness of the lake which the owners have no control over. Otherwise, it was very nice. The owners were very accomodating and stayed in touch with any concerns we had. The photos were exactly as described. Would definitely recommend this property. The house was exactly as described and was so homey and clean! The location was perfect...so quiet yet close to main highways to get around. My kids loved the lake and my son loved finding baby frogs and fishing. I loved that the beach area was right at the house and I could sit on the deck and watch him. The air conditioner was a welcome addition as well. We could definitely stay again! The house was in excellent condition - very clean and spacious with all of the amenities you might need. The back yard opens right onto the lake. We really enjoyed canoeing, sitting on the deck, and walking around the area. The owners were very helpful and professional. The only downside is that the neighbor's houses are relatively close by.